We’d love your help. Let us know what’s wrong with this preview of The Holy Spirit by Sinclair B. Ferguson. To ask other readers questions about The Holy Spirit, please sign up. There’s no doubt that Sinclair Ferguson is a savvy theological writer. There’s no doubt that the Contours of Christian Theology series by IVP is a theological heavyweight either. While I couldn’t exactly call this my favorite Ferguson title, it did dig deep as the series is known to do. Books in this series don’t merely regurgitate the main tenets of a doctrine but linger where it makes sense to look under stones where treasure might be found. I always reach for this series when I’m starting a d There’s no doubt that Sinclair Ferguson is a savvy theological writer. There’s no doubt that the Contours of Christian Theology series by IVP is a theological heavyweight either. While I couldn’t exactly call this my favorite Ferguson title, it did dig deep as the series is known to do. Books in this series don’t merely regurgitate the main tenets of a doctrine but linger where it makes sense to look under stones where treasure might be found. I always reach for this series when I’m starting a detailed study of a particular doctrine. All too often, Reformed theology is accused of diminishing the Holy Spirit. Ferguson does an excellent job of proving the opposite true. Whether it be through the sacraments, our union with Christ, or our sanctification, the Spirit is at the center of our Christian lives. The chapters "The Spirit of Christ," "Spiritus Recreator," and "The Sanctifying Spirit" were personal highlights. Diria que é leitura obrigatória para todos os que desejam conhecer o que a Escritura tem a dizer sobre a Pessoa e obra do Espírito Santo de Deus. Essa obra magnífica junta exegese sã, teologia bíblica e sistemática sem perder o enfoque pastoral, sempre nos remetendo a Cristo, uma vez que o Espírito sempre nos aponta para Ele. Recomendadíssimo! Comprehensive treatment of the third person of the Godhead, well worth reading. I can see this one being referred to again and again. Overly intellectual (more than it needs to be in my opinion). Hard to read through. I did not find it very helpful in my personal life or understanding of the Holy Spirit. R. C. Sproul calls Sinclair Ferguson the world’s leading expert on the person and work of the Holy Spirit today. Sinclair Ferguson is one of those rare authors that gives you MUCH more than you bargained for. In reading Ferguson, you’re not just learning about the Holy Spirit, but so much more - Union with Christ, sanctification, what it means to be made in the image of God, the history of sacraments, what it means to fall short of the glory of God. In reading great authors you reap the benefit o R. C. Sproul calls Sinclair Ferguson the world’s leading expert on the person and work of the Holy Spirit today. In reading Ferguson, you’re not just learning about the Holy Spirit, but so much more - Union with Christ, sanctification, what it means to be made in the image of God, the history of sacraments, what it means to fall short of the glory of God. In reading great authors you reap the benefit of decades of wisdom compressed into a few hundred pages. It's not a fast read. And you'll have to look up a few words in the dictionary. But great for reading a few pages every day in your Quiet Time. Very Biblical and Christ-centered book. "The center of the Spirit’s ministry: to illumine the person and work of Christ." Chapter one, "The Spirit and Sinclair Ferguson's biblical-theological treatment on the Holy Spirit is a rich and sumptuous theological feast for any serious-minded believer who wants to know more about the so-called "shy member of the Trinity." In eleven meaty chapters, Ferguson gives a comprehensive, if not exhaustive, biblical overview of the person and work of the Holy Spirit, all along the way drawing on historical theology and charitably interacting with perspectives different from his own. - Spiritual Christology (this particular discussion helped to scratch some itchiness that has been driving me crazy as of late). Excellent. Not in full agreement with Ferguson on his view of the gifts of the Spirit, but he is charitable even where he disagrees. And his overall grasp of the Spirit's role in the New Testament is brilliant. Combines the best of historical and systematic theology. I think his defense of the Filioque could have been a lot stronger and more convincing. "Thus, to have the Spirit is to have Christ; to have Christ is to have the Spirit. Not to have the Spirit of Christ is to lack Christ. To have the Spirit of Christ is to be indwelt by Christ (Rom. 8:9-11). There is clear ontological distinction, but economic or functional equivalence. In this sense, through the resurrection and ascension, Christ ‘became life-giving Spirit’" (Ferguson, The Holy Spirit, 54). Deep insights like this are scattered throughout the book. By God's grace, I love Jesus more after reading The Holy Spirit. Highly recommend! outstanding book. It will remain my chosen desert island book on the Holy Spirit. My only one caveat is that I do wish Sinclair didn't feel it necessary to write with such difficult and sometimes really obscure English words - on a couple of occasions they weren't even in the Oxford Concise Dictionary - and not just theological words either - just obscure English. HOWEVER the work is brilliant. Thank you Dr. Ferguson. Helpful read. Covers the breadth of issues relating to the Holy Spirit. A really great starting point for anyone who wants to begin the process of thinking deeply about the person and work of the Holy Spirit and the Trinity in general. Ferguson is dealing with lots of scholarly issues that he doesn't address by name which can be off-putting if you aren't expecting that. This is the best book (outside the Bible) on the Holy Spirit that I've ever encountered. Ferguson provides scholarly analysis (written in an accessible way) for the person and work of the Holy Spirit. Controversial issues (i.e. gifts of the Holy Spirit) are handled in a way that is wise and pastoral. Highly recommend! This book contains a great amount of good, true information, but it’s written in such a way that you will have to read with the book in one hand and a dictionary in the other if you plan to understand anything. Masterful, reasonably comprehensive, fair and conversant, articulate, illuminating. This is now my standard for pneumatology texts. I re-read sections of this book over and over again, and I feel like it is slowly sinking in. Such rich theology explained so well. Pretty much the best accessible book on the topic out there. Highly recommended. Reformed but without the breath of the Spirit. "To have the Spirit is to have Christ." Great book for knowing how Christ's work are applied to us through his Spirit. Not only academic but also great for the Christian life. Simply the best contemporary exposition on pneumatology. Highly recommend. Really good. Though we might separate on a few points, I learned loads. Filled with refreshing truths and insights, nevertheless, the book was sometimes unnecessarily and theologically dense. 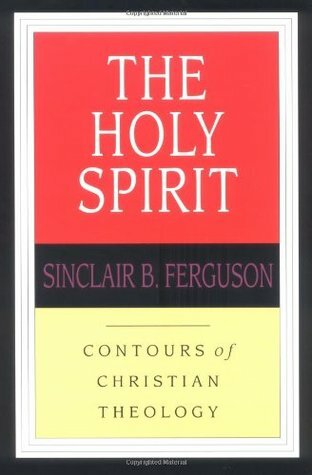 Ferguson writes about the Holy Spirit as a biblical theologian. The framework around biblical theology states that everything in the Bible has a redemptive historical value to it. He begins with this comment, “The central role of the Spirit is to reveal Christ and to unite us to him and to all those who participate in his body…. Every facet of the application of Christ’s works ought to be related to the way in which the Spirit unites us to Christ himself, and viewed as directly issuing from pers Ferguson writes about the Holy Spirit as a biblical theologian. The framework around biblical theology states that everything in the Bible has a redemptive historical value to it. He begins with this comment, “The central role of the Spirit is to reveal Christ and to unite us to him and to all those who participate in his body…. Every facet of the application of Christ’s works ought to be related to the way in which the Spirit unites us to Christ himself, and viewed as directly issuing from personal fellowship with him” (100). Ferguson explains that the main focus when dealing with the ordo salutis is not to necessarily discover the logical order, but instead to draw closer to Christ. He then makes this statement, “The blessing of salvation become ours through the Spirit, exclusively, immediately, simultaneously and eschatologically in Christ” (Ferguson 102). Several advantages stem from this line of thinking as Ferguson suggests. First, “it means that we cannot think of, or enjoy, the blessings of the gospel either isolated from each other or separated from the Benefactor himself” (Ferguson 102). He states that it also guards the believer against unhealthy thought and comparison to a logical chain of events, instead of to a believer’s present experience with knowing Jesus Christ. Finally, Ferguson shows that his understanding of the ordo salutis fully represents the eschatological structure of many of the biblical/theological terms. The eschatological or “already/not yet” structure is important to Ferguson’s discussion. He describes the structure this way, “That glory, which God has restored in Christ, the head of the new creation, awaits a yet-future event” (Ferguson 93). For example, “regeneration is a present reality, but it also awaits its consummation (Mt. 19:28)…. Even glorification, while consummated in the future, has already in a sense begun here and now through the indwelling of the Spirit of grace and glory (2 Cor. 4:18; Rom. 8:28; 1 Pet. 4:13)” (103). Even justification follows this pattern as believers, though already justified, “will appear before the judgment seat of Christ to receive what is due to them (2 Cor. 5:10)” (103).